Common – “Black America Again” – ARTium Recordings / Def Jam Recordings. Cody ChesnuTT ft Raphael Saadiq- “I Stay Ready” / “Bullets in the Streets and Blood ” One Little Indian Records. Carlos Niño & Friends – “Flutes, Echoes, It’s All Happening!” – Leaving Records / Stones Throw. Maurice White – Maurice was a true pioneer, trail blazer and founder of one of the last great big bands: Earth Wind & Fire. I have appreciated the varied, skilled and positive grooves Maurice brought us through out most of my life. Prince – On Prince I could write for days, one of the greatest performers, musicians and composers of the last 100+ years, his influence touched so many genre’s we now take for granted to the point that his full significance may be lost on the generations who were not around to see his full impact being gradually cemented into the foundation of what followed in so many genres from Hip Hop, House, Soul, 2Step, Slow Jams Neo Soul and Rock and EDM to name a few. Also a great Jazz spirit. Thankfully Prince was so prolific and left us a huge body of work. David Bowie – I wasn’t a massive Bowie fan, but I was a fan, more of his material beyond his biggest ‘Ziggy’ hits period. I admired his style and vision, a true performance artist right up to the last second of his life. Scotty Moore – The raw sound of Scotty’s guitar was one of the players that made me want to play the guitar. I was lucky enough to meet Scotty and discuss guitar playing with him, a priceless experience for me. Rod Temperton – A true UKSoul, Jazz-Funk and UK songwriting pioneer. George Michael – George was many things to many people, including a suburban Soulboy and Soul DJ at one point, and also a great UK singer songwriter who’s Soul influence could often be heard in his music. Rudy Van Gelder – A pioneering producer of my favourite record label, Blue Note Records. Norman Mayers – Norman was a kindred spirit over in LA, USA supporting KTF from afar with his “Nu Soul Mag” and putting on comparable events over there in LA. Nicole Ferraz, Colin Favor(missed Colin in last years’ list). R.I.P. music creatives still pushing out there. Thanks for the music everyone. I hope you’ve enjoyed reading these charts over the years. Listen to & buy K15’s music via the above link. Paul Aaaron (Sat Dec 7th), K15 (Fri Dec 6th) & Honza (Thurs Dec 5th). A strictly 18 and over event. Incognito, Todd Terry, MAW’s NuYorican Soul & her own solo work. reaches out with extended arms and engulfs your musical desires. arriving in a club for a performance and hearing her voice repeatedly. At Work & many others. 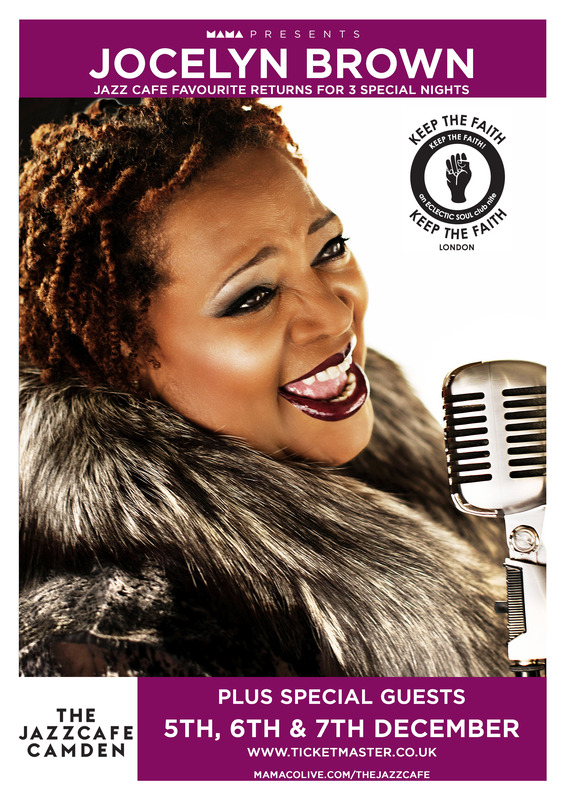 A Jazz Cafe Mama event in association with Keep The Faith Events.